Are the glaciers our fault? – Is It Getting Warmer? Two conclusions are fairly obvious from the above graph. First, the size of glacier recession has been occurring almost since the time when we started measuring the size back in the late 50s. 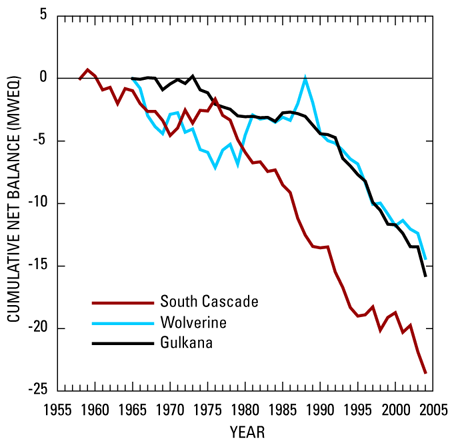 The second is that the reduction seemed to increase rather rapidly in the late 80s and early 90s. If we draw a straight line to average the reduction from 1960 to 1975, we will see a totally different rate as compared to the line that averages 1980 to 2005. There are several factors that influence the size and positive or negative growth of a glacier and if you read some of the Related Posts below you will learn much more. It isn’t all the average temperature in the valley. So it is hard to say that there is a direct causation especially since the larger the glacier, the more likely it will affect its micro-climate to create the conditions to allow it to keep growing (it chills the air above it promoting snowfall). Therefore, there is a solid line of reasoning that says that once a glacier retreats a certain percentage, it will continue to rapidly shrink. However, if we compare the glacier curve above with the famed Mauna Loa CO2 readings, you see that in the late 80s we tripped over the feared 340PPM which many feel is the trigger point for CO2 causing real damage to the climate. So there is a real argument to be made that CO2 is the cause. The answer to the question: I don’t think we really know. It is to complicated of a climate model for us to completely understand. As I have argued before (primarily in the comments of various posts such as this one), I don’t believe this stuff one way or the other. I think we need to spend a lot of time and effort to figure this out definitively. The answer to the question is simply too important to guess at.